Shipping is Free* on all orders over $75 to the 48 Contiguous States (Before Tax). Orders under $75 will ship for a flat rate of $7.50. Shipments to Alaksa, Hawaii, AA/AE/AP, Guam, Puerto Rico and the Virgin Islands ship for a flat rate of $7.50 regradless of order value. *Free shipping applies to online orders only, and only applies to orders shipped within the 48 Contiguous United States. If you need shipment outside of The States, please see the International Orders section below. We ship Monday through Friday, excluding all holidays. In stock orders will ship within 1 business day. We reserve the option to ship your order via UPS or USPS First Class or Priority Mail. Shipments going to a APO/FPO, or standard PO Box, can be delayed by 1 business day and shipped via USPS Priority Mail. We do not guarantee same day shipping, but we will do our best to ship all orders within 1 business day. All orders shipped to addresses in California, will be charged the appropriate state sales tax based on our zipcode of 90638. Original shipping fees are non-refundable. Shipping fees are for the services provided by the carrier and will not be refunded if item is returned for any reason. Please note: With the rise in packages being stolen from residential addresses, once a package has been confirmed delivered by the shipping carrier, we cannot be held resposible if a package is stolen. No refund will be given, and no free re-delivery will occur. We hope you can understand our position. If this is a concern for you, we strongly reeommend having your package delivered to your place of work (if possible) or to a destination where you can guarantee someone will be there to accept your package. If you would like product shipped to any location, other than the United States, please send an email to . Inform us of the product you would like to purchase (Item #, Size, Qty.) and we will respond with instructions on how to send payment. Unfortunately, we cannot extend our current shipping rates to orders outside of the United States. Standard International shipping rates will apply. Import duties, taxes, and charges are not included in the item price or shipping cost, or any quote. These charges are the buyer's responsibility. Please check with your country's customs office to determine what these additional costs will be prior to purchasing. When shipping a product to a customer outside of the United States, crossing a border into another country, the package is subject to an extra element: customs and duties. Customs is the government border agency that reviews all inbound and outbound shipments. Caiman Store handles the paperwork for you, though please be advised that the government border agency is a standalone agency that has the ability to hold or delay a shipment, refuse a shipment and return it, or assign a duties fee. While we make every effort to assist with the smooth processing of your shipment through Customs, returns and duties remain a possibility. 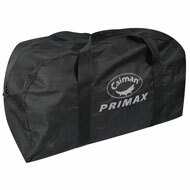 While supplies last, on all orders of $125 or more, you will receive a spacious Caiman® Duffle Bag (a $19.99 value) at no additional cost to you. If you choose to return any product purchased that will result in the order total falling below $125, you will be required to return the promotional products as well. Otherwise, you will be charged current MSRP for those products.